Christmas comes but once a year, so you probably don't want to commit to a permanent tattoo. Once you are overcome by the holiday spirit, you'll want our temporary Christmas Tattoos. 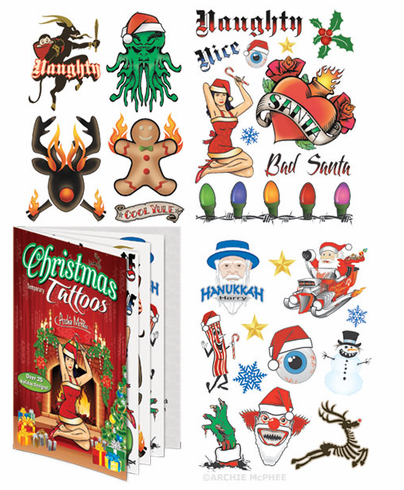 Includes more than twenty-five holiday designs with a touch of tattoo culture tossed in. You'll get Santa in a hot rod sled, a flaming reindeer and even Hanukkah Harry! Comes in a 5-1/2" x 4-1/4" (14 cm x 10.8 cm) paper booklet.